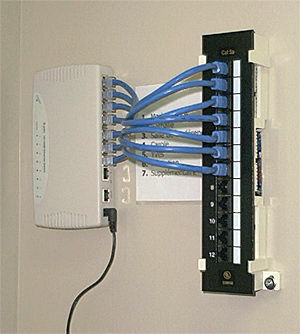 Computer solutions in Ste-Agathe: Quebec: Laurentians: LAN and WAN network installation on copper cabling or optical fiber. Service Informatique Pierre Forget is a personalised service focused on computer solutions for hardware or software. backup service, software installation and troubleshooting, INTERNET help, technical help, private or group courses, WEB site design and Ecommerce solutions. Our territory covers from St-Sauveur to St-Jovite and from Chertsey to St-Donat. We also do major jobs anywhere else if needed. 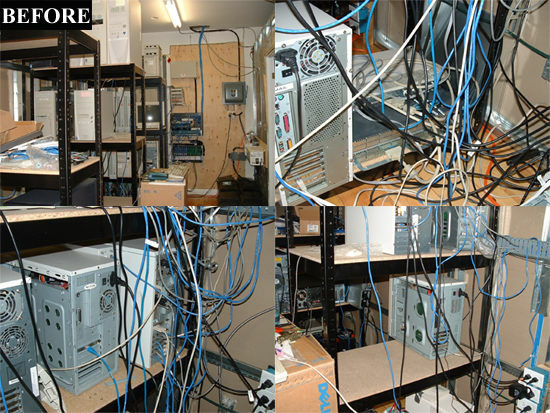 If your network installation looks like "spaghetti" (picture to the right), just like many installations, please take a look down the page to view our work and call us for an estimate. School job : Desks are coupled together with connections boxes in-between running in standard plastic conduit. Standard plastic conduit runs in-between the desks, with 12 access, and there is a front connection box (1) for temporary access. 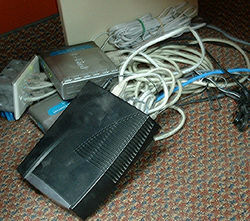 Network hubs (2) are secured inside a locked metal box to prevent tampering. All boxes are firmly secured to the desks to prevent tampering. Classroom drops (3) are in standard plastic conduit. The main network hub (4) and patch panel (5) are mounted on a sturdy metal rack mount, bolted directly to the cement floor. All the apparent wiring is routed through a standard rectangular plastic conduit (6) in the back of the closet. All wires in the ceilings are bundled together, attached with ty-raps every few feet, and secured to the different structures available. Wire runs are straight and put as high as possible to avoid physical interference with other loose wiring. 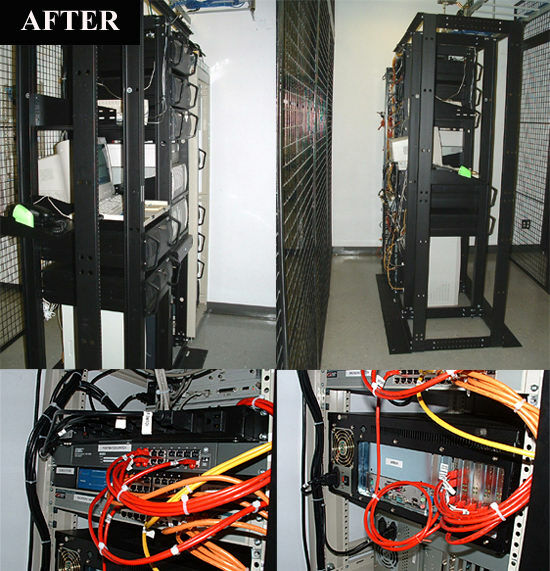 Here is another example, before and after my work, of an Internet server cage. Don't hesitate and write to us at info@st-donat.com, or call us directly at 819-424-2051 and we will be happy to help you solve your computer problems. If you need computer equipment, don't hesitate to contact us. We will be pleased to give you an estimate. Our site of all the Quebec restaurants with menus and categories: pizza, chinese food, thai food, sushi, italian food, greek food, japanese food, etc.